The first year of trading at ‘Man at Ease’, 19 New Street, was the most enjoyable and satisfying of my business life. Having people crossing the threshold, myself being friendly, also patient to ensure they return for a second purchase was the aim. To build the stock as well as relationships, both most important. Towards the latter part of the second year, 23 Lendal (opposite G.P.O) became vacant. The tall, slim, glass-fronted unit (as today) caught my imagination for a younger trendier trade naming “Easy Guy”, on the way to becoming a multiple. 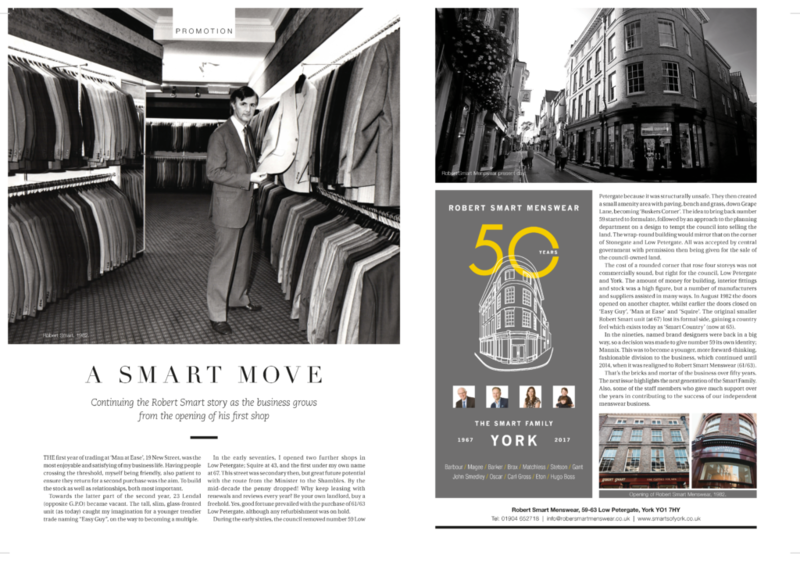 In the early seventies, I opened two further shops in Low Petergate; Squire at 43, and the first under my own name at 67. This street was secondary then, but great future potential with the route from the Minister to the Shambles. By the mid-decade the penny dropped! Why keep leasing with renewals and reviews every year? Be your own landlord, buy a freehold. Yes, good fortune prevailed with the purchase of 61/63 Low Petergate, although any refurbishment was on hold. During the early sixties, the council removed number 59 Low Petergate because it was structurally unsafe. They then created a small amenity area with paving, bench and grass, down Grape Lane, becoming ‘Buskers Corner’. The idea to bring back number 59 started to formulate, followed by an approach to the planning department on a design to tempt the council into selling the land. The wrap-round building would mirror that on the corner of Stonegate and Low Petergate. All was accepted by central government with permission then being given for the sale of the council-owned land. The cost of a rounded corner that rose four storeys was not commercially sound, but right for the council, Low Petergate and York. The amount of money for building, interior fittings and stock was a high figure, but a number of manufacturers and suppliers assisted in many ways. In August 1982 the doors opened on another chapter, whilst earlier the doors closed on ‘Easy Guy’, ‘Man at Ease’ and ‘Squire’. The original smaller Robert Smart unit (at 67) lost its formal side, gaining a country feel which exists today as ‘Smart Country’ (now at 65). In the nineties, named brand designers were back in a big way, so a decision was made to give number 59 its own identity; Mannix. 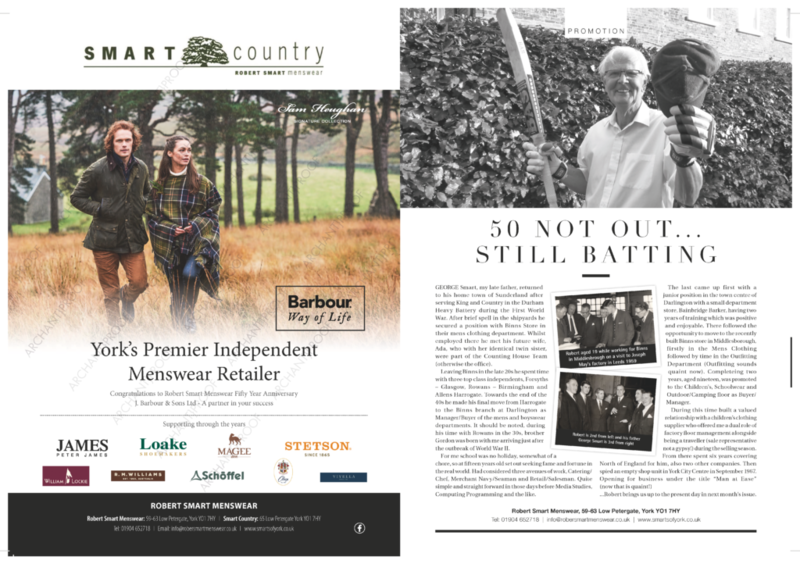 This was to become a younger, more forward-thinking, fashionable division to the business, which continued until 2014, when it was realigned to Robert Smart Menswear (61/63). That’s the bricks and mortar of the business over fifty years. The next issue highlights the next generation of the Smart Family. 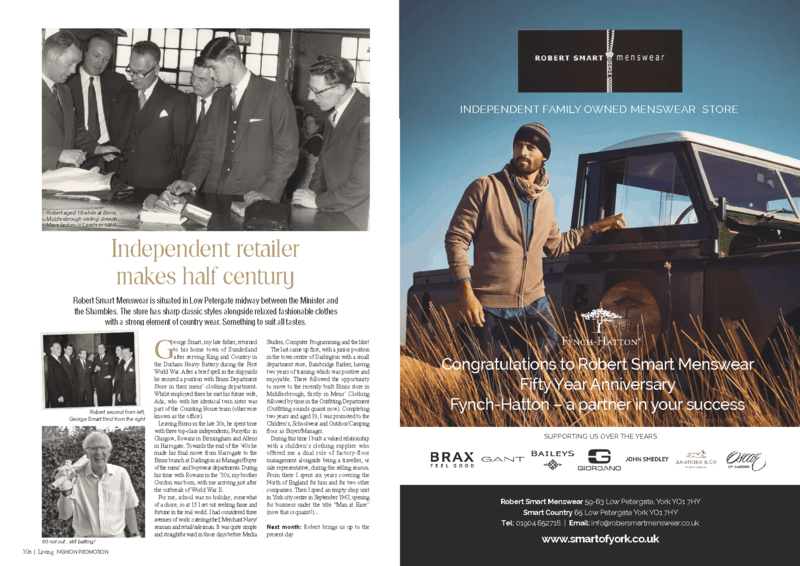 Also, some of the staff members who gave much support over the years in contributing to the success of our independent menswear business.